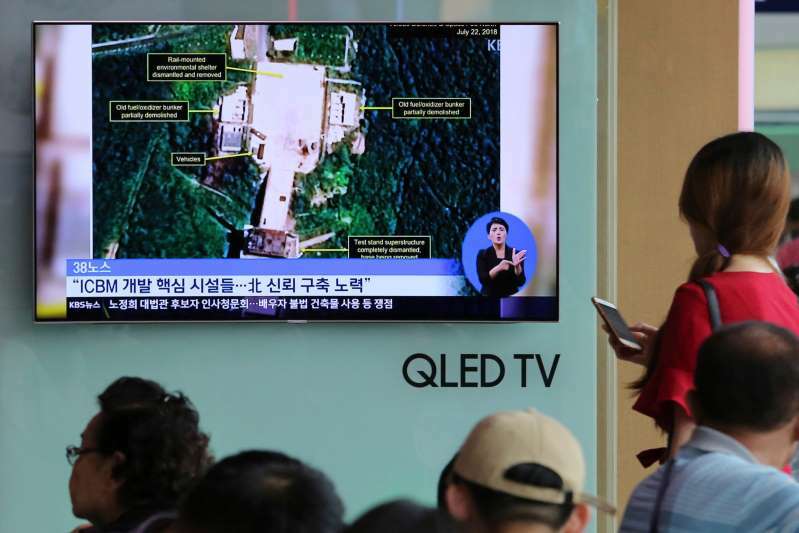 A TV screen on Tuesday in Seoul, South Korea, displaying the Sohae launch site in the North, which satellite evidence suggests it has begun to dismantle. After declaring he has plenty of time to solve the North Korean nuclear crisis, President Trump celebrated on Tuesday what he claimed was an early victory: satellite evidence that the country is dismantling a missile test stand in a small first step toward securing commitments made by its leader, Kim Jong-un, last month in Singapore. But inside the White House, Mr. Trump’s aides wonder whether they are falling into a familiar pattern of endless negotiations with the North, which in the past has destroyed a few symbolic facilities but kept expanding its arsenal. And at the same time, the president is now arguing that the clock is moving the other way in Iran. Mr. Trump is focusing on the nuclear program there with new urgency and threats of military action — even though it was his decision in May to withdraw from a deal that limited Iran’s nuclear capabilities for more than a decade. [post_ads]The combination — flatter Mr. Kim, threaten the mullahs — comes straight from Mr. Trump, based on his negotiating approach as a New York developer, according to several current and former American diplomats and intelligence officials who spoke on the condition of anonymity. But cajoling business partners and undercutting rivals does not translate easily in geopolitics. And in recent conversations, additional officials have confessed to being confounded by the president’s strategy. “On the surface, it makes little sense,” said Richard N. Haass, the president of the Council on Foreign Relations and a former official at the State Department and National Security Council who worked for several Republican presidents on both issues. “Trump has rejected a detailed pact that kept Iran out of the nuclear weapons business for a decade, while embracing a vague communiqué that allows North Korea to keep its nuclear weapons for years, and possibly forever,” Mr. Haass added. Neither the White House nor the State Department has explained the approach. It is likely to be a major subject of questioning — along with what happened in closed-door meetings between Mr. Trump and Mr. Putin in Helsinki, Finland — when Secretary of State Mike Pompeo testifies on Wednesday in the Senate. By all indications, Iran is still complying with the nuclear accord that it reached with world powers in 2015. American intelligence agencies have concluded that Iran’s leaders are trying to use Mr. Trump’s withdrawal from the accord to rip apart the coalition of European nations, Russia and China that had joined the United States to curb Tehran’s nuclear program. It is clear Moscow will not join in Iran’s economic isolation: At an otherwise friendly news conference with Mr. Trump last week in Helsinki, President Vladimir V. Putin of Russia criticized the American withdrawal from the nuclear deal. At the same time, the officials warned, Mr. Trump’s premature declaration on Twitter that “there is no longer a Nuclear Threat from North Korea” could come back to haunt him. That statement took much of the pressure off Mr. Kim, and appears to be helping him evade international sanctions, with the help of China and Russia. On Tuesday, at a rally in Kansas City, Mo., Mr. Trump sought in a single breath to join the two fronts as successes. His comments were the latest example of how the president is casting the best possible light on North Korea’s steps so far, ignoring that the country is still producing nuclear fuel and, some American intelligence officials suspect, adding to its arsenal of 20 to 60 weapons. The dismantlement of the missile site is significant because it will slow the North’s ability to test weapons’ engines. Given its history — it was from that location that the North at least twice launched primitive space satellites that experts in the West saw as experiments for firing a warhead — it is reminiscent of other steps that the country took a decade ago, when it blew up the cooling tower of a nuclear reactor. In recent weeks, and in public and private statements by Mr. Trump, Mr. Pompeo and other aides, hints of the president’s double-barreled strategy have emerged. The current and former diplomats and intelligence officials said Mr. Trump has convinced himself that the only hope of coaxing Mr. Kim to give up his weapons is to effusively praise him. That means ignoring the tens of thousands — if not hundreds of thousands — of North Koreans whom Mr. Kim has put in gulags, his execution of perceived opponents and his refusal in Singapore to sign on to any document that created a timeline for denuclearization. The American military commander in South Korea, Gen. Vincent K. Brooks, said on Saturday that while the North’s abilities were undiminished, Mr. Kim appeared to be softening his threats. He noted that it had been more than 235 days since North Korea had conducted a nuclear weapons test. “In many ways, the lack of trust is the enemy we now have to defeat,” General Brooks said in a presentation via satellite to a national security conference in Aspen, Colo. Building trust, he said, would take time. He was immediately answered by Sue Mi Terry, formerly one of the C.I.A.’s lead analysts on North Korea, who argued that the Trump administration had become so invested in the success of the summit meeting with Mr. Kim that it had ignored reality. “We don’t have an agreement. We don’t have a deal. We don’t have a declaration,” said Ms. Terry, now at the Center for Strategic and International Studies. She noted the gap between how Americans describe “denuclearization” and how North Korea describes it. “Right now, we have nothing,” she concluded. Administration officials said Mr. Pompeo was counseling the president that the process of denuclearization on the Korean Peninsula would be lengthy — extending through the rest of Mr. Trump’s term. Even Dan Coats, the director of national intelligence, conceded at the Aspen forum that an earlier timeline of a year as pressed by John R. Bolton, the national security adviser, was not going to happen. Meanwhile, Mr. Trump senses weakness in Iran. Major European companies that promised to invest in the country after the 2015 accord are backing out; even Boeing, which was going to supply aircraft parts for an unsafe Iranian commercial air fleet, has reversed course. In a speech over the weekend at the Reagan library in California, Mr. Pompeo all but encouraged uprisings against Iran’s leaders, highlighting the corruption of the government. “Iran is run by something that resembles the mafia more than a government,” he said, a statement he could also have made about Russia or North Korea, but chose not to. Some of his own officials were left wondering whether it was a bluff — intended to force the Iranians into a Korea-like negotiation, or a distraction from his other problems.